Greetings from snowy Connecticut! I had planned to post a photo of all the snow on the ground but I ran out of time. Take a look at last week’s photo and add about a foot and a half on top of what’s on the ground in that photo. Also add in some tunnels and canyons to get to the firewood shed and you’ll get the idea. Oh, and remove the arbor you see in the first photo. The guy who plows for us clipped it with the blade and made my plan to for some repairs and paint this spring a moot point. Ah well. 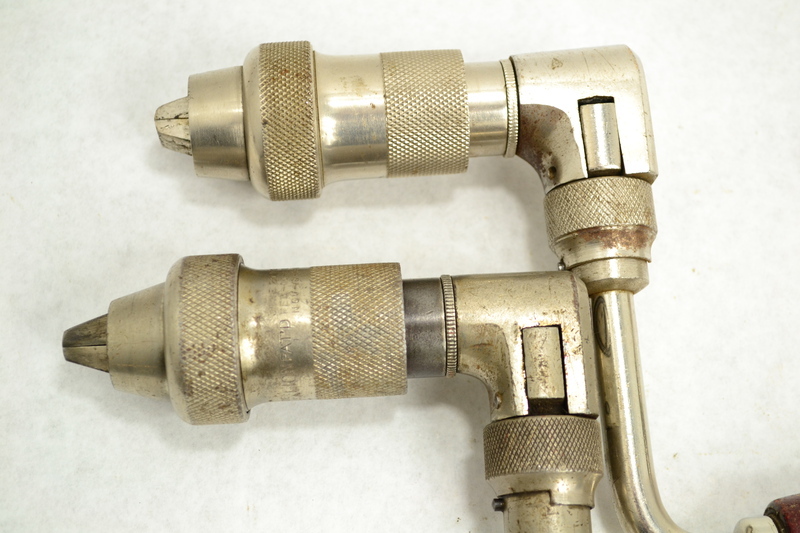 New Tool List Today- 130 new items- including a few scarce planes, layout tools, good edge tools, some early molders, etc.. Have a look at my For Sale page and let me know if you find something you like. Please also note that I added a bunch of new items to my Parts and Projects page- blades, planes that need TLC, odd bits, etc. Good afternoon from snowy Connecticut! It’s a gorgeous day here in New England. It’s enough snow to be fun, but not so much that it makes it hard to get around. Two of three kids are in school today so I’m able to post a new list of tools. This update contains about 130 new items. Theremaining few items from last month were marked down. This update includes some excellent molding planes and lots of high quality edge tools, amongst other things. I’ve been busy the past week fufilling as many special requests as possible. Please- if you are lookign for something specific please let me know. As always, thanks for reading and happy woodworking! It’s a gorgeous day here in New England. It’s enough snow to be fun, but not so much that it makes it hard to get around. 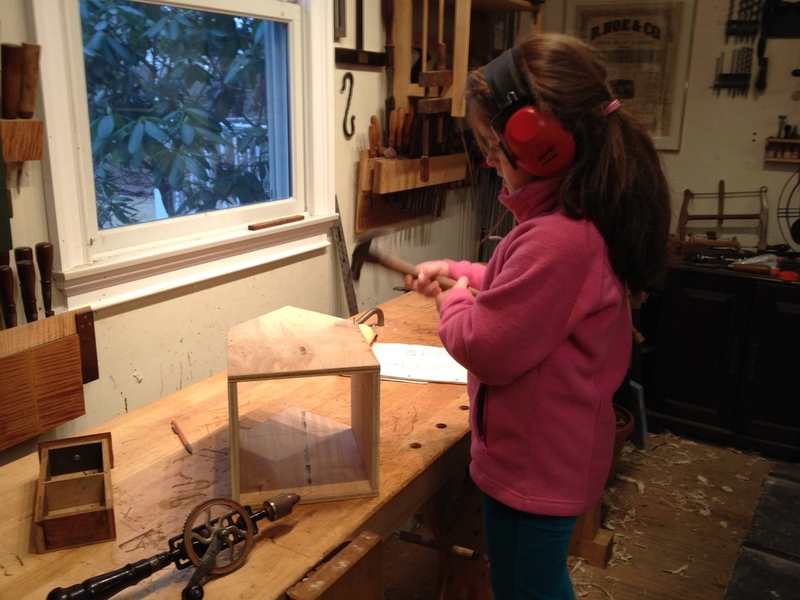 Two of three kids are in school today so I’m able to post a new list of tools for sale. This update contains about 130 new items. Theremaining few items from last month were marked down. This update includes some excellent molding planes and lots of high quality edge tools, amongst other things. I’ve been busy the past week fufilling as many special requests as possible. Please- if you are lookign for something specific please let me know. Author Joshua ClarkPosted on December 30, 2013 Categories Tools For SaleLeave a comment on One More Tool Sale for 2013! I hope everyone has a Merry Christmas- I’ll see you again just before the new year- December 30 with another batch of tools. That is, if mother nature doesn’t interfere again! Sorry this is later than usual- I’ve been franticly adding new items to the list throughout the morning. I added 130 new old tools to my For Sale List today. Have a look and see if you find something you like. This list has a lot of good, usable molding planes including some exceptional British planes from early makers. I also have a lot of edge tools, a couple of good RJ auger bit sets, some braces, Stanley planes, and the expected assortment of useful and unusual tools. I expect to have two more tool sales this year. To work around the holidays I plan to have them on Monday, Dec 9, and Monday, Dec 30. One of these might be a night time (east coast US) sale since I’ve had a number of requests for one of those. Keep an eye on my Twitter or Google+ pages for more details. Sorry this is later than usual- I’ve been frantically adding new items to the list throughout the morning. 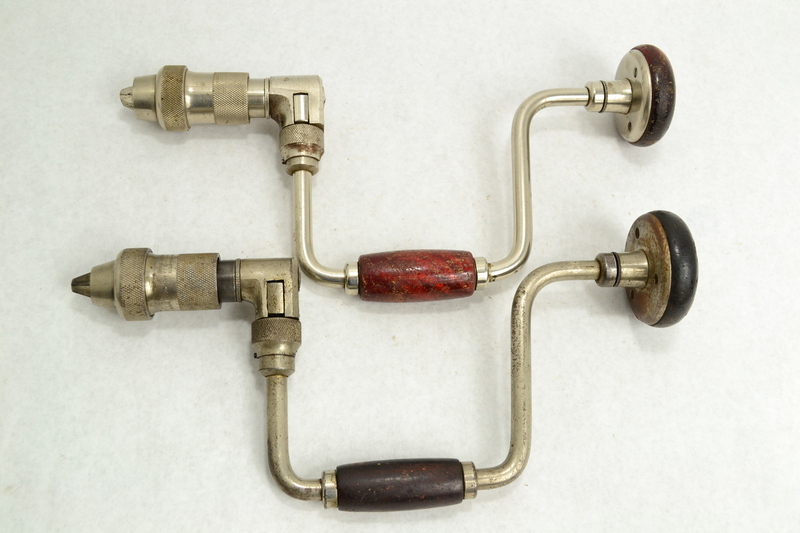 I added 130 new old tools to my For Sale List today. Have a look and see if you find something you like. 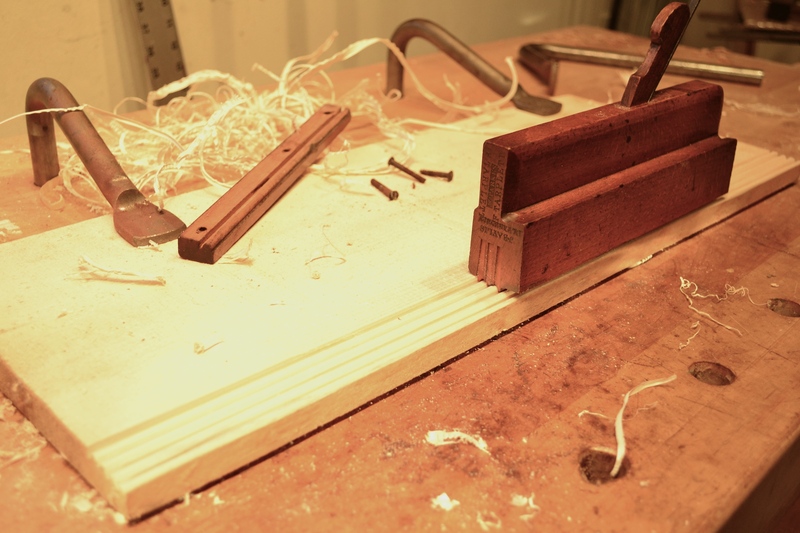 This list has a lot of good, usable molding planes including some exceptional British planes from early makers. I also have a lot of edge tools, a couple of good RJ auger bit sets, some braces, Stanley planes, and the expected assortment of useful and unusual tools. This week I was cleaning up some early British molders and found this exceptional 1/4 reed and follow. It’s around 200 years old and it was sharp enough to use. After brushing off some dust it cut reed after perfect reed without as much as honing the blade. The danger in using these tools is I become attached to them. I have a fairly small user kit and a small working molding plane collection. I try to limit the size of my kit to whatI can fit in one cabinet and my tool chest. Otherwise I’d be keeping every other tool that passes through here. This plane, though, looks like it’s going to stay here. This is 30 minutes late, sorry.. somebody forgot to pack the kid’s lunchbox in their backpack today. There is a fresh batch of tools available for sale here: http://hyperkitten.com/tools/ForSale/Tools_FS.php There are 120 new items including an excellent batch of molding planes, some nice edge tools, tons of layout tools, and the usual batch of Stanley baench planes in assorted shapes and sizes. The next tool sale will be on Monday, Nov. 11. After that I hope to have three more sales to finish out the year, but I may consolidate that to two to work around the holidays. I have a large number of tools in stock and two excellent collections on their way here so the lists should be stacked with good user stuff. As always, if you are looking for something specific please drop me a note and let me know. Are here fall is firmly here with several light frosts. So far my cold frames are keeping the last of the summer greens alive which keeps the rabbit happy. Our wood stove was lit for the first time this season on Oct 22. This is a new record for us- it’s usually started much earlier in the season. Here’s hoping for a mild winter! PEXTO Samson and a more robust design than the North Brothers Yankee. If you need a beefy brace fora big job there’s none better. They tend to be a bit on the pricy side since they are always in demand and not very common. Here’s an interesting bit of trivia. Millers Falls made braces for Craftsman (I belive) in the 1940s-50s. These were high-quality braces but lacked the exotic wood pad and handle, but otherwise identical in every way to the mainline Millers Falls tools. You can tell the Millers Falls Craftsman tools by the “BB” maker code in small font near the Craftsman logo. I’ve seen a couple of different models- one of these is unmistakably a Millers Falls Lion in branded for Craftsman. I’ll admit I’ve become a bit of a brace geek. I’m a big fan of the Millers Falls Lion brace. It’s a heavy-duty brace every bit as well-made as the PEXTO Samson and a more robust design than the North Brothers Yankee. If you need a beefy brace fora big job there’s none better. They tend to be a bit on the pricy side since they are always in demand and not very common. Here’s an interesting bit of trivia. Millers Falls made braces for Craftsman (I believe) in the 1940s-50s. These were high-quality braces virtually identical in every way to the mainline Millers Falls tools but lacking the cocobolo handle and pad. You can tell the Millers Falls Craftsman tools by the “BB” maker code in small font near the Craftsman logo. I’ve seen a couple of different models- one of these is unmistakably a Millers Falls Lion branded for Craftsman. Take a look at these two and see if you can pick out the Millers Falls Lion from the Craftsman. OK, so the stained pad and handle give it away- the top is the Craftsman, the bottom the Millers Falls no. 772 made ca. 1925.. Other than the wood, both are identical in every way. So keep an eye out and an open mind toward those Craftsman braces. You might find a Lion in disguise.